After a concert tour of Germany in 1885-86, Camille Saint-Saëns withdrew to a small Austrian village, where he composed Le Carnaval des Animaux in February 1886. He wanted to offer this lovely fancy of exquisite music mingled with good-natured jokes as a surprise at the annual Shrove Tuesday Concert. Carnaval... has since become one of Saint-Saëns's best-known works, played by the original eleven instrumentalists, or more often with the full string section of an orchestra. Normally a glockenspiel substitutes for the rare glass harmonica. Ever popular with music teachers and young children, it is often recorded in combination with Prokofiev's Peter and the Wolf or Britten's The Young Person's Guide to the Orchestra. As International Concert Organist and Composer Ekaterina is the rarest of musicians - performing on an instrument not noted for its popularity, she manages, season after season, to keep audiences on the edge of their seats in the finest concert halls of Russia, Europe and around the world. Ekaterina Melnikova is unusual in Russia for her mastery of the English, French and Russian traditions of organ music. Having received the finest education in two of the world’s most prestigious music schools, the Moscow Conservatory and London’s Royal Academy of Music,. She is a sought-after guest at Westminster Abbey and St. Paul’s Cathedral in London, La Trinité and Notre Dame in Paris, Cologne and Monaco cathedrals and other celebrated concert venues in Russia, Germany, France, Italy, Switzerland, Spain and elsewhere. Ms. Melnikova’s transcriptions for organ Le Carnaval des Animaux by C.Saint-Saens, Polovtzian Dances from Prince Igor by A.P.Borodin and Barber of Seville Sinfonia by G.Rossini have been published by Wayne Leopold Editions, North Carolina, USA. Among her many compositions are Missa XXI for SATB choir and organ, Beethoven-Tango for organ and double basse and Toccata Freeway for organ solo. 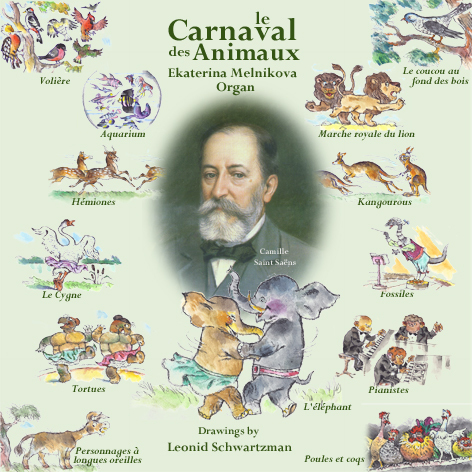 In Ekaterina’s own words: “I simply adore the Grande Fantasie Zoologique, as Camille Saint-Saens called Le Carnaval des Animaux. The composer wanted it played only posthumously, not to shadow a bit his glory of a serious composer. Why? Well, an attentive listener will recognize fragments of the tunes popular at the time - last half of the XIXth century - wittingly interwoven into the music. The elephant double bass is gracefully waltzing the Ballet de Silphes from Berlioz’s La Damnation de Faust and the tortoises are in fact dancing in their own way to Offenbach’s Can-Can. or “Liolly” (his nick name), is the formidable artistic creator of the cartoon drawings of Le Carnaval des Animaux. He was born August 30, 1920 and is the legendary Russian classic of animation, the creator of a visual image of Cheburashka and other cartoon characters. BAM 2063 © & ℗ 2016 Bel Air Music - All Rights Reserved.